En route to New York through Pennsylvania and New Jersey my heart was sickened each time I saw the body of a dead deer along the highway, which I witnessed way too many times. The moon was full moon a week ago, which may have had something to do with it. One driver said he had seen quite a large number of dead deer coming from New Jersey on the other side of the highway. I wish to investigate and contact biologists, zoologists, someone, to find out whether there’s a chance of organizing scientists to research the more likely places that deer will cross highways in these wooded areas of the Northeastern United States, where they are more likely to cross due to less construction, and find a way to emulate what California has already begun – building animal bridges / wildlife crossings. Their habitat can be stretched across these so that they have more of a chance of survival. Why do I care? Because I care about all creatures. There are indeed segments of the human race who do recognize how awesome and beautiful all of the different creatures are who inhabit this planet with us. 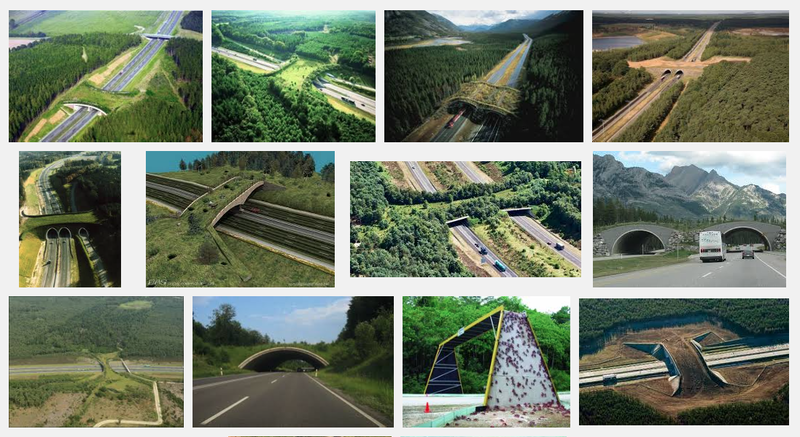 Here’s a great article regarding wildlife over-passes – green bridges describing animal wildlife over-passes already in place in various parts of Europe, and the West of the U.S., which can be adopted everywhere. The following pictures each link to articles about the subject. Thank Yougourthen Ayouni for the pic of he and Carol at the G bar Manhattan halloween. It was my trip to NYC for Halloween where I encountered perhaps a dozen dead deer, on my way there and back – very upsetting!